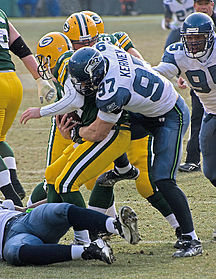 Green Bay quarterback Aaron Rodgers being sacked by Seattle defensive end Patrick Kerney. In American football and Canadian football, a sack occurs when the quarterback (or another offensive player acting as a passer) is tackled behind the line of scrimmage before he can throw a forward pass, when the quarterback is tackled behind the line of scrimmage in the "pocket" and his intent is unclear, or when a passer runs out of bounds behind the line of scrimmage due to defensive pressure. This often occurs if the opposing team's defensive line, linebackers or defensive backs are able to apply pass pressure (also called a pass rush) to quickly get past blocking players of the offensive team (the quarterback's protection), or if the quarterback is unable to find a back to hand the ball off to or an available eligible receiver (including wide receivers, running backs and tight ends) to catch the ball, allowing the defense a longer opportunity to tackle the quarterback. Performing a sack is advantageous for the defending team as the offense loses a down, and the line of scrimmage retreats several yards. Even better for the defense is a sack causing the quarterback to fumble the ball at or behind the line of scrimmage; this is also known as a strip sack and can result in a turnover if the defense manages to obtain the ball. A quarterback that is pressured but avoids a sack can still be adversely affected by being forced to hurry. In the National Football League (NFL), it is possible to record a sack for zero yards. The QB must pass the statistical line of scrimmage to avoid the sack. If a passer is sacked in his own end zone, the result is a safety and the defending team is awarded two points, unless the football is fumbled and either recovered in the end zone by the defense for a touchdown or recovered by either team outside the end zone. To be considered a sack the quarterback must intend to throw a forward pass. If the play is designed for the quarterback to rush (run) the ball, any loss is subtracted from the quarterback's rushing total (and the play is ruled a tackle for loss as opposed to a sack). If the quarterback's intent is not obvious, statisticians use certain criteria, such as the offensive line blocking scheme, to decide. Unique situations where a loss reduces a quarterback's rushing total (not a sack) are "kneel downs" (used to run time off the game clock). Rodgers sacked by Everson Griffen. A player will receive credit for half of a sack when multiple players contribute to the sacking of a quarterback, even if more than two players contributed. In the NFL yards lost on the play are added as negative yardage to the team's passing totals; however, the quarterback's individual passing total stats remains unchanged. NCAA continues to subtract sack yardage from individual rushing totals. A BYU quarterback being sacked by Air Force. The term "sack" was first popularized by Hall of Fame defensive end Deacon Jones in the 1960s, who felt that a sack devastated the offense in the same way that a city was devastated when it was sacked. According to former NFL coach Marv Levy, it was Washington Redskins coach George Allen who actually coined the term when referring to Dallas Cowboys quarterback Craig Morton. Allen purportedly stated before a game, "Before we play those Dallas Cowboys, we’re going to take that Morton salt and pour him into a sack." Prior to "sack", the term "dump" was often used, and the NFL's statistical office recorded all sacks under "dumping the passer". The NFL only began to keep track of times passers lost yardage in 1961 and no credit was given to the defensive player responsible until 1982. Researcher John Turney of the Pro Football Researchers Association estimated that Jones recorded 173½ sacks in his career. Controversial NFL rule changes made for the 2018 season prohibit tacklers landing on the quarterback after making a sack, with the punishment being a roughing the passer penalty. Of all forms of defensive pressure against the opposition's passer, sacks provide the most immediate impact by ending the offensive play. However, quarterbacks sometimes avoid a sack by throwing an incomplete pass or risking an interception. According to Football Outsiders, a quarterback hurry is the most common form of pass pressure. In the 2009 NFL season, there were 1,106 sacks and 3,268 hurries, and a hurried quarterback generally averaged fewer yards per pass play compared to the average pass play. These records are from 1982 onwards, the year the NFL started officially recording sacks. ^ Deacon Jones had 26 sacks in 14 games in the 1967 season, and 24 sacks in 14 games in the 1968 season. However, as sacks were not officially recorded by the NFL at that point, Michael Strahan is credited with the single-season record. ^ Al "Bubba" Baker had 23 sacks in his rookie 1978 season. However, as sacks were not officially recorded by the NFL at that point, Jevon Kearse is credited with the single-season rookie record. ^ L. C. Greenwood had 4 sacks in Super Bowl X. However, as sacks were not officially recorded by the NFL at that point, Reggie White, Darnell Dockett, Kony Ealy, and Grady Jarrett are credited with the Super Bowl record for most sacks in a single game (3). ^ "2011 Football Statisticians Manual, p. 17" (PDF). NCAA. Retrieved October 15, 2017. ^ a b "Sack or Dump: To Quarterback It's All Downhill". The Milwaukee Journal. November 7, 1975. Retrieved June 5, 2013. ^ "Jones, NFL coiner of 'sack the quarterback,' dies at 74". CNN. June 4, 2013. Retrieved June 5, 2013. ^ Branch, John (November 4, 2006). "Unofficially, Sack Record Doesn't Add Up". The New York Times. Archived from the original on February 3, 2015. ^ "The NFL's controversial new roughing the passer rule, explained in a 3-minute read". SBNation.com. Retrieved September 28, 2018. ^ Long, Howie; Czarnecki, John (2011). "Football For Dummies". John Wiley & Sons. p. 166. Retrieved February 2, 2014. ^ Edholm, Eric (December 28, 2015). "J.J. Watt becomes only two-time 20-sack player, does so on safety". Yahoo! Sports. Retrieved February 1, 2015. ^ "Super Bowl X play-by-play". USA TODAY. January 11, 2002. Retrieved April 5, 2013. Wikimedia Commons has media related to Sack (American football). This page was last edited on 27 January 2019, at 20:25 (UTC).